Before drilling made oil available in large quantities, small amounts for household uses could be collected by placing blankets to soak up the oily scum on the top of ponds, a practice begun by the Seneca Indians. Dogged persistence led this man to drill -- and drill -- and drill, seeking oil deposits. His success launched an Oil Rush and brought the world a new energy source. Born in Greenville, New York, Edwin Drake's first career was as a conductor on a brand new, sometimes dangerous conveyance: the railroad. 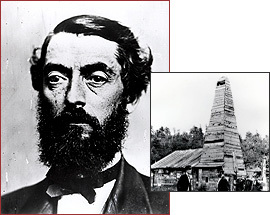 In the late 1850s, New Haven speculator James Townsend hired Drake to investigate Titusville, Pennsylvania for oil deposits. He had seen a Yale chemistry professor's report that rock oil could be refined and employed for illumination, lubrication, and other uses. When Drake arrived, locals took to the agreeable man right away -- but laughed at his futile purpose. Small amounts of oil had seeped from the ground forever --but no one had figured out how to extract it. Drake tried the usual method, digging trenches -- and failed. He studied the land and speculated about oil deposits. His intuition told him he should drill into the ground, just as salt mining was done. From July 1858 to May 1859, he struggled to find a borer to do the work, spending the New Haven money to buy a steam engine and build an engine house in the meantime. Through a long, cold winter, the merchants of Titusville extended credit to their poor, misguided new friend and his family. Folks started to call him Crazy Drake. In April 1859, Drake's contract with Townsend expired. From his own pocket, Townsend sent $500, but the other directors of his Seneca Oil Company refused to provide more capital, after having invested $2000 (nearly $40,000 in 2002 dollars) and seen no results. At last Drake found a reliable driller -- William A. "Uncle Billy" Smith, a blacksmith who forged his own tools and reported for work in late May. They built a derrick of pine wood and began drilling. Workmen drilled all summer, six days a week, with the Sabbath Drake's inviolable day off. When water flooded the hole, Drake innovated a solution; he drove an iron pipe down to bedrock, then placed the drill inside the pipe to keep water out of the excavated shaft. The men drilled, and drilled, and drilled. Drake at last struck black gold, on August 28, 1859, nearly seventy feet down. By early fall, Pennsylvania's Oil Rush was on. Real estate prices skyrocketed and fortune-seekers arrived. Within a few years the oil refining business would attract John D. Rockefeller, a careful businessman who would use crafty tactics to build one of America's great industrial fortunes. Drake was not so lucky. Townsend's company fired him, and he lost his money on Wall Street. He never patented his drilling method. Years later, the oil barons who owed their wealth to Drake offered him financial support. And in 1873, Pennsylvania voted an annuity of $1,500 to the "crazy" man whose determination founded an industry. Drake died in 1880.